The importance of education is undeniable. It is a movement from darkness to light. In the socioeconomic scenario of today’s world, education is the key to open the doors of development and opportunities. It is hard fact that anyone having basic reading, writing and arithmetic capabilities are more likely to cultivate and procure other imperative life skills which are inevitable for a skillful and productive life in this exceedingly competitive realm. A recent visit to Skardu was filled with a pleasant revelation for this scribe. The visit was undertaken as a leisure trip to the land of beautiful to witness the gorgeous landscapes and experience the unmatched magnificence of the Northern Areas of Pakistan. The broken roads, the rural setting of the city and absence of infrastructural expansion clearly spoke of the underprivileged and flouted reality. However, the splendid mountains and the landscapes compensated for the broken or under construction roads. Although these were sponsored messages, they connected to the ancient times when religious teachings and life wisdoms were carved on rocks by religious Moguls. Such carved rocks of Buddha can also be found in this region, and one specifically in Skardu. It kindled a thought whether this painted tagline is just a selling message by the seller or are these slogans really making a difference. My thoughts were still submerged in how good the captions were, when I saw little girls, with covered heads and books in their hands reading in middle of a field in a village beside the road. It looked so serene and picturesque. Furthermore, I passed countless groups of children of ages 6 to 16 with books and uniforms as they were returning from their schools. With the current low literacy rate of Pakistan, these catchphrases on the roadside reiterate the prominence of education and its irrefutable importance, like a ray of hope not only for this region but also felt assuring for an optimistic prospect of Pakistan. As revealed by the economic survey of Pakistan, Pakistan’s literacy rate has dropped from 60% to 58%. Various factors can be held responsible for this decline but it is alarming for a country like Pakistan to bear such low literacy rate. 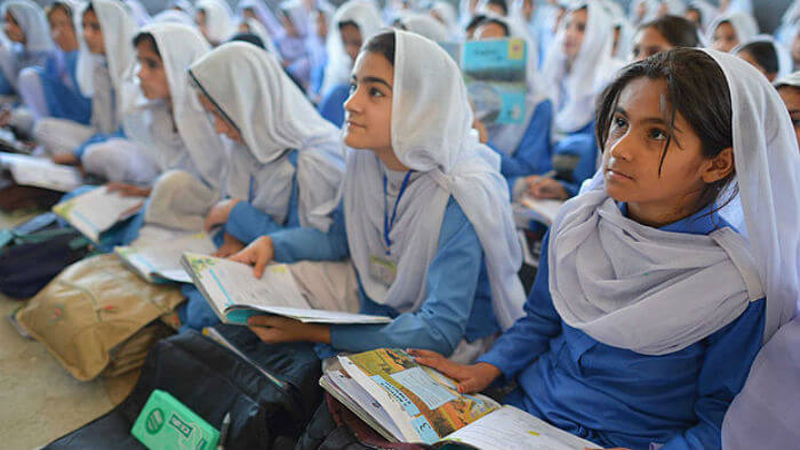 As per the statistics acquired from the Gilgit-Baltistan Department of Education, there are a total of 1,926 schools out of which, 1,401 are primary schools, 304 are middle schools, 198 are high schools and 23 schools are providing education up to higher secondary level. Out of these 1,926 schools, 878 are for boys, 529 are for girls and 519 are providing mixed education to both girls and boys. Out of these 529 coeducation schools, 517 schools are primary level education institutions. Out of these 1,926, 583 are in Gilgit region – with 215 in Gilgit, 227 in Ghizer, 47 in Hunza, and 94 in Nagar. While in Baltistan region, there are total 852 schools out of which 297 are in Skardu, 278 in Ghanche, 126 in Shigar and 151 in Kharmang. In Diamer-Astore region, there are 491 schools out of which 323 are in Diamer while 168 are in Astore. These figures are accumulated statistics from the public sector schools managed by the provincial government, public sector schools managed by federal government, Army, GB Police, Pakistan Bait-ul-Maal, and private sector schools. In Gilgit-Baltistan region total enrolments of the students in all sectors is reported to be 322,166 approximately. Out of all the enrolments, the percentage for boys and girls is 55% and 45% respectively. The district wise admissions reported out of total enrolments, 44% are in Gilgit region, 40% in Baltistan region and 16% in Diamer-Astore region. Similarly, in Baltistan region, out of all the enrolments 53% are boys and 47% are girls. While in Diamer-Astore, the ratio of boy-girl enrolment is 70% boys and 30% girls. The statistics showed a promising trend of progress whereas in 1981 the literacy percentage of boys was 23% and girls only 3% in the area. As per the ASER survey of 2015, for the age group of 6-16, the enrolment rate is 85% of which Astore 92.8%, Diamer 47.9%, Ghanche 90.2%, Ghizer 96.9%, Gilgit 88.2%, Hunza-Nagar 97.6% and Skardu 81.3%. The high literacy rate and high ratio of girls going to schools for basic education is very inspiring and encouraging for this region. However, there are only two universities in the province, Karakoram University and recently operational Baltistan University. The prospects of higher education are not much available and students have to go to universities in other provinces for engineering, medical and other professional studies. Nonetheless, the current setting as witnessed, stamping the importance of basic education is promising to open gateways to higher education availability in the region in the near future. Undoubtedly, young students of these areas are going to be a supporting stake for the advancement of Pakistan, and are going to be actively contributing towards Pakistan’s prosperity and development. The idea and dreams embedded in the hearts and minds of the locals through these wonderfully worded wall chalking and advertisements is an initiative that would bear very progressive and promising outcomes. Education creates dreams; dreams of betterment, dreams of progress and dreams of tomorrow. These dreams of personal growth are catalyst for motivation and ascending steps for collective success. If only these dreams are painted all over the country, and it becomes a national manifesto, there is no doubt that we will rise way above our problems and tread towards a stable and developed Pakistan. In words of Malcolm X: Education is the passport to the future, for tomorrow belongs to those who prepare for it today. The writer is a freelance columnist, currently based in Gilgit.